In the story of King Jehoshaphat found in 2 Chronicles 20, there are many parallels to the conditions prevailing in America at the present time and what the people of God should be doing. Jehoshaphat has been informed that the armies of the Moabites, Ammonites, Syrians, and a “great multitude” of the East had come up against the kingdom of Judah. His immediate response was to seek the God of his ancestor, David. Now, having gathered the people together before the temple, he leads them in a prayer of dependence on the God of Abraham, Isaac, and Jacob. He was rightly named, for “Jehoshaphat” translates “The LORD (Jehovah) is Judge.” He therefore recited his case, and that of his people, before the Judge of the world. In response to the king’s prayer, “the Spirit of the LORD came upon Jahaziel … a Levite … in the midst of the assembly” (2Ch 20:14). His inspired message to the king is a message much needed by believers in America today. It is clear that Jehoshaphat’s immediate submission to God and his prayer of humble dependence was the pre-emptive strike on the enemies of Judah. When God’s people humble themselves in true repentance from the arrogance of independence, and pray, God will fight on their behalf as He has promised (2Ch 7:14). By a return to faith in God, His Word, and those who proclaim it, the spiritual battle was won—the need for fighting physically was avoided. and Mount Seir, who had come against Judah; and they were defeated … they helped to destroy one another. It took the people of Judah three days to carry away the spoils, after which they gathered “in the valley of Berachah” (blessing, 2Ch 20:26), to bless and praise the Lord for His great victory. While God at times fights while His people stand still, there are many other cases when the people have to join in the fight, as the spiritual and the physical armies clash (2Sa 5:17–25). Such was the case in the founding of this country. Although the thirteen American colonies declared independence from Britain in the “Declaration” which was signed on 4 July 1776, it was also a “declaration of dependence” upon Almighty God. The signers of the Declaration could not have been more clear about their intent. This bold venture was not done without careful consideration of Scripture and history, which led them to conclude that “all men are created equal, that they are endowed by their Creator with certain unalienable rights …” that is, rights which cannot be abrogated by man, nor even lost through surrender. They stand true of all men at all times, whether they claim them or not! 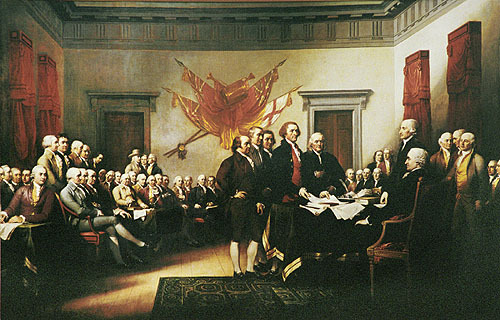 Due to the study of the Holy Scriptures, they rightly concluded “that to secure these rights, Governments are instituted among men, deriving their just powers from the consent of the governed …” It was on the basis of these convictions, drawn from the Word of God, that our forefathers were willing to risk everything, while they still had the chance (emphasis added). Thus, they made their stand “appealing to the Supreme Judge of the world (i.e., “Jehoshaphat”—The LORD is Judge) for the rectitude of our intentions … with a firm reliance on the protection of divine Providence, we mutually pledge to each other our lives, our fortunes, and our sacred honor.” They could not have been more clear that their independence from the growing tyranny of Britain was due to their dependence upon Almighty God. Never in all her history has America been so close to those dark days of our Founding Fathers. Never has there been a greater need for deep searchings of the Scriptures to meet our present crises. Never before, since our founding as a nation, has the cause of liberty been so threatened—not only for America, but also for the whole world. For without a free and strong America, the “lamp of freedom” will be extinguished throughout the world. Show me one nation that can long withstand its enemies without a stronger America to join their fight. This is why the present spiritual struggle is so crucial. And this is precisely why those who believe and trust in the Lord Jesus Christ across this nation must “set ourselves to seek the Lord” in humble and repentant prayer. I am often asked, “Why do we need to repent, and repent of what?” My answer is, “Read Daniel 9.” In praying for his nation, the prophet Daniel—of whom nothing wrong is ever recorded—identifies with the sins of his people. As Jesus Christ, the “one Mediator between God and men” (1Ti 2:5) was willing, by both His baptism and the cross, to identify with the sins of His people and the world, so we are called to do the same. Furthermore, none of us are guiltless in this generation. We have all contributed, both in sins of commission and omission, to the present sorry state of our once-great land. It is high time we began to take our calling seriously—as priests “according to the order of Melchizedek” (Heb 5:6)—and to intercede on behalf of our nation.